Subscribers to the VTBird list will not be surprised by the fact that some of our favorite birding spots are located in the town of Shelburne. A circle with a two mile radius with the entrance to Shelburne Farms as the center point, encompasses some of the best birding terrain in the Champlain Valley. Shelburne Farms itself offers several walking trails through woodlands, wetlands, pastures, and open fields, that provide excellent birding opportunities. 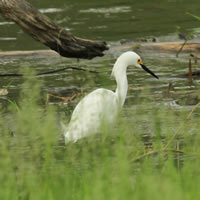 For example, this is one of the few spots in the Champlain Valley where Cattle Egrets are consistently found. During the migratory season, a variety of shorebirds and ducks regularly stop over in the marshes not far from the Inn. Other notable avians reported at Shelburne Farms include Bald Eagles, Northern Harriers, Merlins, Indigo Buntings, Orchard Orioles, Sedge Wrens, Bobolinks, and Savannah Sparrows. This list represents a small sample of the birds that can be found here. Even better, from November to May, access to the walking trails is free, and a free trail map is available at the Shelburne Farms Welcome Center. Further up Bay Road, one comes to Shelburne Bay Park and the Shelburne Bay Boat and Fishing access. Both vantage points offer excellent views of Shelburne Bay, which provides shelter for a variety of ducks and geese during the winter months. The GMAS January field trip to Shelburne Bay produced a typical roster of winter waterfowl: — Canada Geese, Mallards, Black Ducks, Common Goldeneye, Bufflehead, and Common Mergansers. Ring-billed Gulls, Herring Gulls, and Greater Black-backed Gulls reside here year-round. Furthermore, rarities pop up at Shelburne Bay regularly. For instance, last summer one of us spotted an athletic pair of Caspian Terns plunging into the water a few yards from the access. Earlier this winter, a Greater White-fronted Goose visited the Bay briefly, accompanied by several hundred Canada Geese and a lone Snow Goose. Finally, a Bald Eagle took up residence along the shoreline of the Bay this winter. Once the Bay is locked in with ice many of the ducks move to the open water on the lake side of Shelburne Point. A short drive north on Harbor Road brings you to the open water at the end of the point near the Shelburne Shipyard. Unfortunately, parking here is nonexistent, so beware and be careful if you stop for a quick look at the waterfowl. In Shelburne Bay Park a “bike path” runs north from the parking area. This pathway is a favorite of dogs and their owners. Accordingly, birds are less frequent along this route. However, the loop up and over Allen Hill yields a greater number of birds, including an occasional Ruby-crowned Kinglet singing in the cedars at the top of the hill. This route also features a wide variety of wildflowers, some magnificent chestnut oak trees on the south-facing slope, and a splendid view across Shelburne Bay to the Green Mountains. Not to be overlooked, across the road from Shelburne Bay Park is a trail known locally as the Ti-Haul Trail. This mile-long pathway was once used as a road bed to transport the steamer Ticonderoga to its current resting place at the Shelburne Museum. Reclaimed as a recreational path connecting Bay Road and Harbor road, the Ti-Haul Trail borders the LaPlatte River Marsh Natural Area. During the past year we recorded over 40 species along this trail, not an extraordinarily long list, but respectable enough. Some of the more unusual birds spotted here included a Ruffed Grouse, a Barred Owl, a Red-bellied Woodpecker, a Northern Shrike, Cedar Waxwings, Yellow and Wilson’s Warblers, an American Kestrel, and a Ruby-throated Hummingbird. These birds were duly reported to the VTBird list. Great Blue Herons, Great Egrets, Black Ducks, Mallards, Wood Ducks, Red-tailed Hawks, Wild Turkeys, Northern Cardinals, Tree Swallows, robins, Red-winged Blackbirds, American Crows, and Song Sparrows are birds that are considered “usuals” at this location. Also, White-tailed Deer regularly forage in the farmland adjacent to the trail, as an added treat. Across the highway from the boat and fishing access is the LaPlatte River Marsh Natural area. This 200 acre preserve is owned and maintained by the Nature Conservancy. There is a marked trail which runs along the banks of the river and a descriptive trail guide is available to help you on your way. This area is a prime location for marsh ducks and wading birds, especially Great Blue Herons, Black-crowned Night Herons, and American Bitterns. Furthermore, in the Spring the “peent” of courting woodcock resounds throughout the marsh at dusk. Bluebirds occasionally nest in the snags jutting out over the open water. Inhabitants of the upland landscape in this area include Ruffed Grouse, Gray Catbirds, Song Sparrows, and Common Yellowthroat to name just a few of the avian species commonly found here. Although boat traffic in the river is heavy during the summer months, the marsh land toward the end of the trail is relatively pristine and is frequented by Mallards, Black Ducks, Wood Ducks, Blue-winged Teal, and of course, the ubiquitous Canada Goose. These superb birding sites in Shelburne are available to the public throughout the year and are readily accessible from the Burlington area. The hiking trails described here are undemanding, requiring minimal effort for maximal gain. Plan to spend a morning or an afternoon exploring these trails this summer. You will be amply rewarded with excellent birding in a bucolic setting. Shelburne Town Beach and Shelburne Pond are fine birding areas in the town of Shelburne outside the limits of the two mile circle we drew at the beginning of this article. Maybe next time.